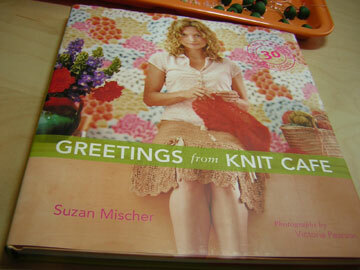 When I wasn't beading or knitting this weekend, my nose was literally buried in this book. It's just delicious! I have already ordered some yarn for an upcoming project, and I can't stop obsessing over the boxer pattern- fun fun book! A few of my fellow bloggers have requested these...and this time I made a big batch, so I can play too! I am working on a cardigan, and I am thinking sushi buttons are in my future! Yes the test kitchens and design studios of Amyville have been busy...I must say there are some creative faeries lurking in the craftroom and in the waterfall in our backyard (more on that to come!) 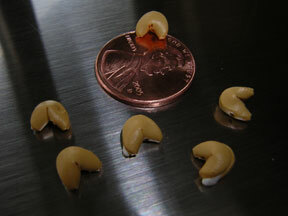 Here's ONE thing I have been up to...super mini cookies...my smallest cookies yet. 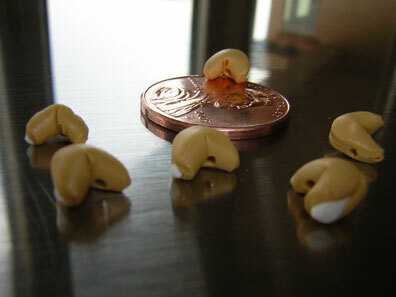 Check them out compared to the penny. I tried to do some artsy perspective photography. All these cookies are the same size... smaller than good ol Abe's head. 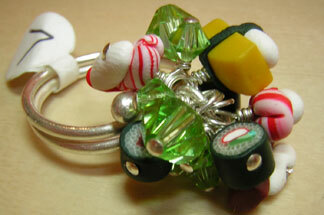 I thinking maybe sock stitchmarkers, tiny earrings... any ideas? Today was a big Amyville photoshoot... which means A) there are new products and B) some fun new designs for the website. Stay tuned for a the new launch date! For now, here is a teaser! 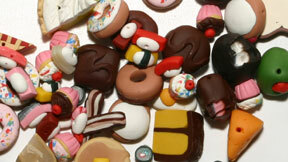 Amyville's Scottsdale Sweets line is officially released! 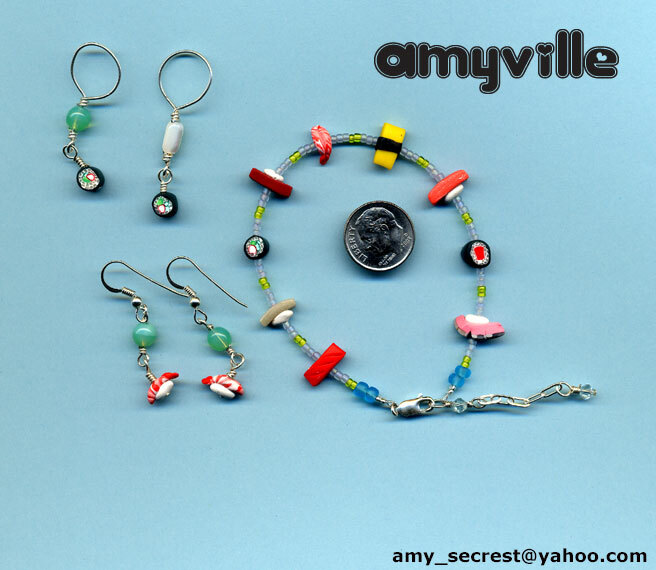 I invite you to check out the new stuff at Amyville. 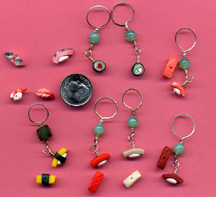 Also note some new items are added to the asian infusion collection... fortune cookie earrings and stitchmarkers. More soon...off to bed early tonight. 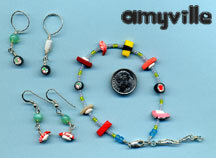 Though "amyville" is still in build phase, I wanted to let the mini-sushi fans know that pieces are available now. If you are interested, please email me. So I watched the second episode of LOST, yeah even though the first one was not what I was expecting, I had to tune in again! Character development is what's got me hooked! 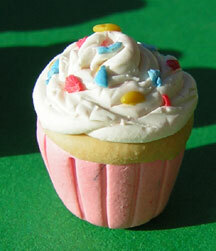 As promised, I will be showcasing a lot of the mini-clay food I am creating. Here is the sushi, you can click on the image for a detailed view, it may take a moment or two to load. 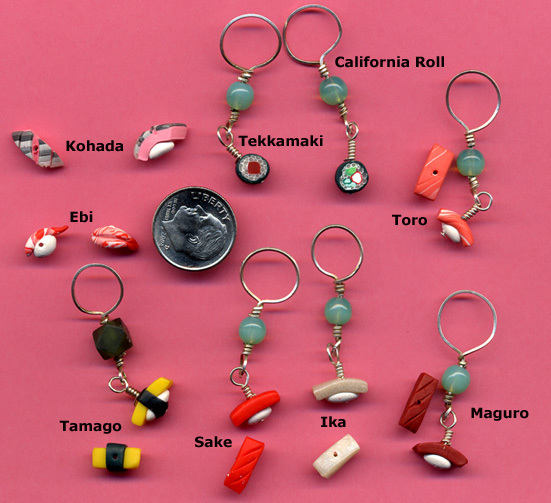 Currently, I have created bracelets, earrings, necklaces, and stitchmarkers (as displayed below) from the sushi collection. Thanks Mariko for the "mad props" on my sushi and the plug for my online store. I will keep everyone posted when "amyville" is up and live! 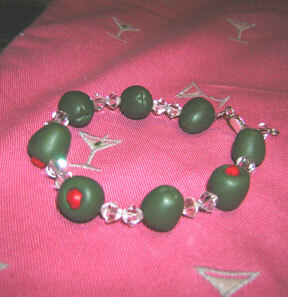 Until then, if you are interested in my sushi or other creations, you can email me. 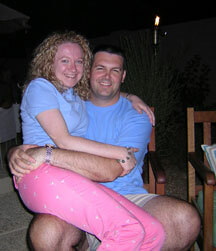 We had a wonderful time at Mark and Cherise's last night. The weather was great--we were actually outside for a portion of the evening, the burgers and snacks were yummy, and we were with good company. And check it out, even a tiki torch in the background! We didn't mean to color coordinate, just sorta happened. On to some fresh baked craftines... After my post on Saturday I realized I didn't have any accessories for my evening's outfit (check out the martini pants-- I call them my "party-pants"-- SJP would be so proud of me) So I made some OLIVES out of premo clay baked them after the Chex Mix was done (hey the oven was already pre-heated, can't beat that opportunity) and decided to string them on tiger tail wire with some swarovski crystals-- what do ya think? We stopped at Jo-Ann Fabrics tonight... and looked at sewing machines... more to follow on that one too!